A noise novel about wrestlers, elevators, and anti-time. Punched through with an irreal morality of haute-punk ethos, GX Jupitter-Larsen's penchant for conveying entropy is an elegantly coded force majeure reminiscent of Henry Darger - but darker, deeper, and with a safety pin jabbed in the nose of our social mores. GX Jupitter-Larsen writes like he's experienced a steel rasp cutting through a two-ton safe, or shooting up Drano with a rusty nail. No future dream is too dire or pointless. The average citizen's nightmare is too saccharine to exist in this Jupitterian planet. Read GX's writings with a seat belt fastened very securely. GX Jupitter-Larsen's Adventure on the High Seas is a courageously unconventional and complex survival guide to entropy, fortified with brilliant archetypes and bold imagery. This book is mandatory reading for the particularly acute. The writings of GX Jupitter-Larsen strike the ear like a jingle text purrs. Indeed, I can think of no other voice in the canon whose rants exult per jig. Born a jarring sextuplet, GX injures prattle. About the author: GX Jupitter-Larsen has been involved in punk rock, mail art, cassette culture, the noise scene, and zine culture. 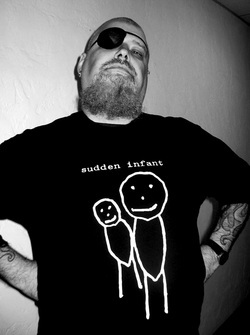 During the 1990s he was the sound designer for the performances of Mark Pauline's Survival Research Laboratories. His best known work is as the founder of the noise act The Haters, who have performed all over the world, and appear on over 300 CD & record releases. Underlying all of GX's work is a mix of aesthetic and conceptual obsessions, particularly entropy and decay, and a self-created lexicon consisting mainly of personalized units of measurement such as the polywave, the totimorphous, and the xylowave. As a writer, GX wanted the same kind of aesthetic fanaticism in his text that the noise scene demands. He wanted to achieve, in language, the same harsh beauty that is rendered in sound by amplified erosion. He wanted a form of writing that had both the feel and sound of nothingness. Taking his cue from the noisy blank video static coming off an empty channel on a TV set, he represented vacuity in text as lines after lines of random letters; to be read one letter at a time.